So I’ll give you the more thorough explanation from Wikipedia. The father of a British sailor is killed by pirates and the son washes up on shore of a fictional island of Bengalla. He swears on the skull of his father’s murderer he will fight piracy and greed and injustice and makes his costume to look like that of a jungle idol. This mantle is also passed down from father to son to father to son so that bad guys think of him as an immortal of “the man that cannot die”. The movie is set in the 1930’s with a rich industrialist named Drax (Treat Williams) looking for some ancient skulls with ultimate power for the purposes of taking over the world. If I were to describe the tone of Phantom is would be an homage to old adventure serials. It is a kind of Indiana Jones jungle romp with a little Batman (a crime fighter with no superpowers) mixed in. 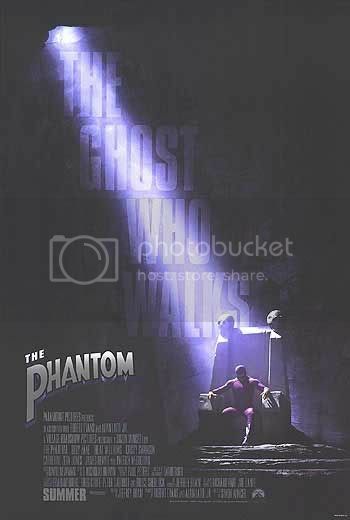 In fact I hear the Phantom comic partially inspired Indiana Jones. This movie is very lighthearted in tone. Phantom is a do gooder who rides a white horse and Treat Williams is the smarmy eeeeeevil guy who really should have a handlebar mustache. There is a good amount of swashbuckling and fisticuffs to make it entertaining. I hate to use the phrase but it’s good clean fun. Billy Zane would not have been my first choice however he plays the part well. He bulked up for this role and looks great and he has his usual charm as well. There is also a pleasant cameo from Patrick McGoohan as Phantom’s father. If I had a gripe, it is that there is not much to this movie. It is fun while it lasts and it is a nice distraction but I’m still a bit disappointed with it. Williams hams it up, but Drax does not stand out in any way as a villain. The romance subplot is dealt with even quicker than the origin story. The plot is a stock “find the mcguffin” with nothing to distinguish itself from any other adventure movie. And we actually get so much Phantom that we get no characterization into his alter ego Kit. We see so much of him posing and saying cheesy one liners we don’t know who Kit is, how he prepared himself to fight crime, who he knows (his partners), or if he has any kind of long term plans. It is like the director is so concerned with keeping the action moving and doing something every five seconds that we don’t have any time to really connect with any of the characters. This is a shame because I think this story has a lot going for it. I would like to see this franchise come back and maybe take some time to build up the mythology of the character. Now this movie bombed, however it has performed very well on DVD; even having the movie be given a blu ray special edition. I heard rumors there is a miniseries and even an attempt of a ‘Dark Knight” style reboot starting in 2010 buuuuuuut I won’t be holding my breath just yet. But I did like this movie. Phantom isn’t great, but it has the rare problem of me wanting more by the end. This movie and The Shadow had the unfortunate fate of being lumped in with several other crappy comic book movies and being lost in the shuffle. So give this movie a shot. This entry was posted on March 31, 2010 at 8:02 am and is filed under P.	You can follow any responses to this entry through the RSS 2.0 feed. You can leave a response, or trackback from your own site.